Gary Slaughter authored the Cottonwood Series of novels, which were published from 2004 to 2012. Unfortunately these are no longer in production, but are commonly available on websites such as Amazon. 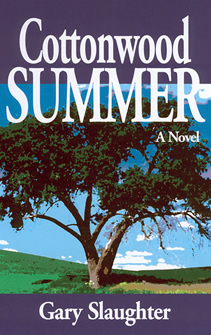 Cottonwood Summer '45, the last novel in the Cottonwood series, continued the tradition of delivering an entertaining, richly-detailed reminiscence of home-front America during the summer of 1945, as well as details of the closing events of World War II. The last days of the war have a profound effect on America, as witnessed by the citizens of Riverton, Michigan, and Nashville, Tennessee, the settings of this fast-paced story in which Jase and his best friend Danny, the heroes of the Cottonwood novels, are plagued by yet another passel of bad guys. Cottonwood Spring, the fourth novel in the Cottonwood series, continued the tradition of delivering a richly-detailed remembrance of home-front America during the spring of 1945. The story is set during the months just before VE Day, the surrender of Germany. Gary Slaughter’s Cottonwood Winter: A Christmas Story was the ForeWord 2008 Book of the Year Award finalist for Popular Fiction. This novel was also a 2008 Indie Book Award finalist for both General Fiction/Novel and for Young Adult Fiction. This, the third novel in the Cottonwood series, follows critically acclaimed Cottonwood Summer and Cottonwood Fall, the 2007 finalist for the Benjamin Franklin Award for Popular Fiction. Gary Slaughter’s Cottonwood Fall was the 2007 PMA Benjamin Franklin Award Finalist for Popular Fiction. This novel is a sequel to his critically acclaimed Cottonwood Summer. The author, Gary Slaughter, has closely crafted small-town life on the WW II home front, vengeful German POWs, relocation of Japanese-Americans, and the 1944 Roosevelt-Dewey Presidential race into the hilarious and heart-rending tour de force called Cottonwood Fall. Cottonwood Summer is a humorous, yet touching, tale of the World War II home front as a small Michigan town copes with a German POW camp on its outskirts and the disgrace of two local women charged with treason after helping two POWs escape. This story is for those who yearn to journey back to simpler times and don’t mind having their funny bone tickled along the way.